Northwood Water Polo Club provides quality training and education for the residents of Irvine and surrounding areas. We have programs for boys and girls ages 6 - 18. We have a high caliber coaching staff with International, Collegiate and High School experience. Established as a "neighborhood" club in 2003, our reputation and quality of training have quickly grown our club into a nationally recognized club. We welcome all levels of players from beginner to advanced - no experience is necessary to join. USA Water Polo membership is required. Our focus is on player development, fundamentals and skills that can be taken well beyond age-group play. Visit our programs page for current session practice days and times. There is also a list of upcoming events on our events page. Registration is ongoing and the regular fee is discounted if you'd like to join us mid-session. New members, please click on Registration to sign up! Want to see what a typical practice looks like or meet the coaches? Come by the pool to watch practice and speak with our coaches. 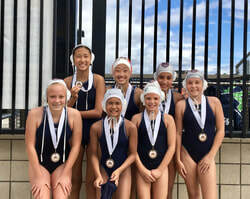 We practice at the Northwood High School Aquatics Center in Irvine and Santiago Canyon College in Orange.